Needing a break from the recent stresses of work Naomi Blake uses the tried and tested method of sticking a pin in the map to select a holiday spot, and she can’t cheat as ex-police officer Naomi was blinded in an accident. The pin lands on Somerset and so she and her partner Alec set off for some rest and recuperation. They find a pleasant B & B and take their evening meals at The Lamb, the pub next door., Susan the manager is friendly, and a fount of local information and gossip. She introduces them to eccentric Eddy who sits in the same corner night after night poring over his maps. They learn that Eddy used to teach history but in the space of two years his wife died of cancer and his teenage daughter was killed in a car accident. Eddy has never actually recovered. When Eddy is found dead in his cottage at the foot of the stairs it looks like an accident – but is it? Gradually Alec and Naomi find themselves drawn into helping Susan, to whom it has fallen to try and trace any relatives. As they search through his cottage it becomes apparent that Eddy is quite different from the eccentric chap who sat in the pub every evening. Then matters take a serious turn. Seeing someone every day for twenty years and then discovering that you don’t know anything about them is fascinating. Do any of us really know the people around us, we think we do, but do we? If we did why would seemingly happy people whose lives are an open book just up and walk out one day! 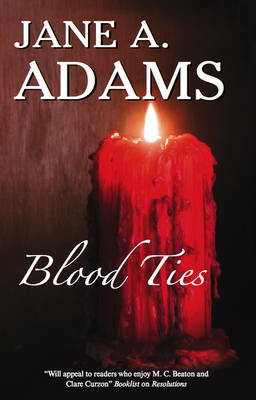 BLOOD TIES, the sixth in the Naomi Blake series, is an intriguing mystery which I recommend. Lizzie blogs at Promoting Crime Fiction.